Do I have a treat for y'all today. A few months ago I had the great pleasure to meet Christin from A Spicy Southern Kitchen and she is just the sweetest. When I asked last month for some guest posts she was quick to offer up this great recipe. Since it is National Pie Day I thought this was the perfect time to share with you all. Hey y’all. I’m Christin from Spicy Southern Kitchen and it’s such a pleasure to get to post on Melissa’s blog today. I had the pleasure to meet Melissa a few months ago in Alabama and as y’all know, you will not find a sweeter, kinder person. Because of that, I thought a sweet recipe would be perfect to share. 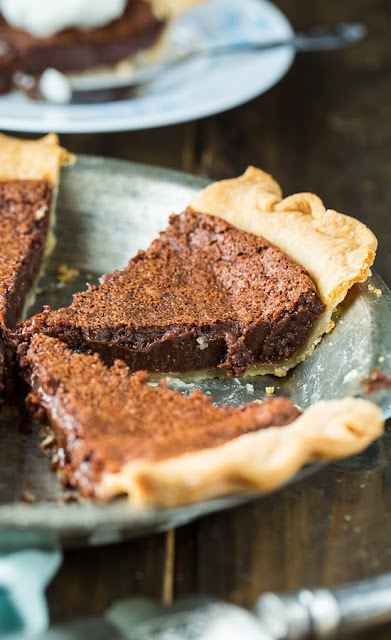 And it doesn’t get any sweeter than Chocolate Chess Pie. 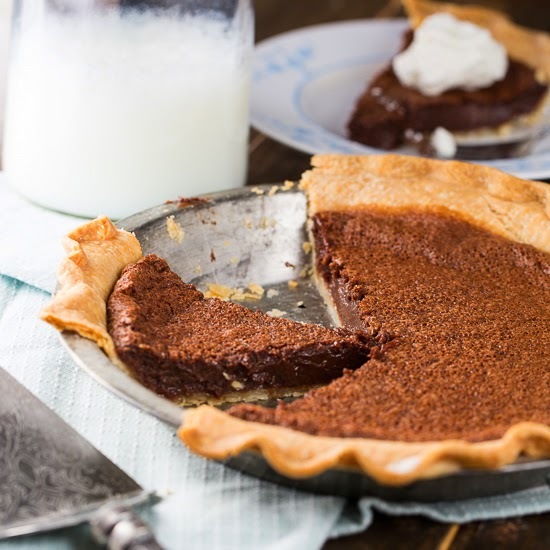 It is a quintessential southern pie made from just a few basic ingredients- sugar, eggs, milk, and butter. 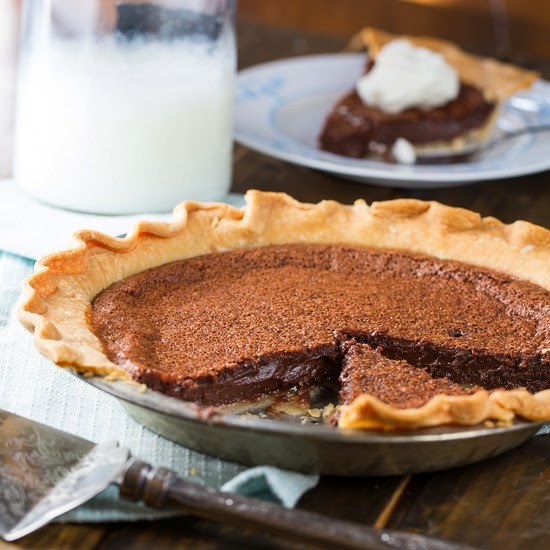 Add in some cocoa powder and you have a chess pie for chocolate lovers. I usually use a refrigerated pie crust for this pie to keep it really simple, but you could use a homemade pie crust. The pie filling literally only takes minutes to prepare. There really isn’t an easier pie to make. The custard-like filling is rich and sweet, but not too heavy. Best served either at room temperature or chilled with a huge dollop of fresh whipped cream which helps balance the intense sweetness of the filling. I like to make this pie a day before we plan on eating it and refrigerate it overnight. Then it will cut really easily into super clean slices. If you don’t let it cool enough before slicing, it will be runny. 2. In a medium bowl, whisk together sugar and cocoa powder until blended. 3. Add eggs, evaporated milk, vanilla, salt, and butter. Mix well and pour into prepared pie crust. 4. Bake for about 45 minutes. There will still be a little jiggle in the middle when you shake it. Cool completely before slicing. I like to chill it in the refrigerator before serving. 5. Serve with whipped cream. Thank you Christin for sharing this great recipe with us today. I cannot wait to make this one for my family. Seriously people, if you have not started following a Spicy Southern Kitchen you need to get on it right away. She is just the sweetest! This pie looks absolutely amazing! 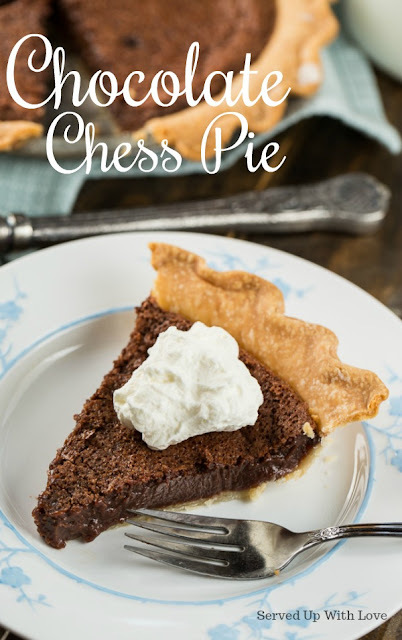 I've always wanted to make a chess pie and a chocolate one sounds even better! Thanks so much sharing! Can't wait to try this! Anything chocolate is good in my book. Thanks for stopping by! Hope you come back often. Does the butter need to be salted or unsalted? In baking I generally use unsalted. Hope this helps. Thanks for visiting. I made this for my MIL for Thanksgiving, she loved it!! Thank you so much for the recipe, it will be a new pie that will be made every holiday season!! Just made for Christmas and it is one of if not the best chocolate pies I've ever eaten and made!! So easy to make and bake and eat lol! Made it with a evaporated milk whipped topping! Perfect dessert! Thank you! Merry Christmas! God bless! That is great D.C.! So glad it was a hit for you and your family! I assume you bake the pie crust first....right? The pie crust needs to be uncooked prior to baking. Oh-oh. I should learn to read all the comments before starting a recipe. It is in the oven, but I baked my crust first as the pie crust box instructed. I'll let you know how it comes out! I will NOT be baking the crust first next time! It came out okay, but the crust was very brown - not burnt, but probably close to it. It was also hard to pry out of the pie plate. I will make this again though, it is very good! Oh no, so sorry! Hope next time it comes out perfect! Is there a way to put the social networking bar in a different place where it won't constantly be in the way of the recipe? And as soon as I posted, the bar moved farther to the left?? Hi Joy, the bar should be all the way to the left. Maybe it was a glitch at that moment. Hopefully it has corrected itself and you wont have any more issues. Thanks for stopping by and checking out such a great recipe. Do you use a regular or deep dish pie crust? Regular or deep dish crust? Made this recipe yesterday for the 1st time. Was the most amazing Chocolate Chess pie I have ever eaten. Used the exact recipe. My boyfriend is impressed and doesn’t realize how incredibly easy it was:) Will continue to use this recipe every time we crave a chocolaty dessert. Can the evaporated milk be substituted with heavy cream? I don't like the taste of evaporated milk. I have not made it this way but if you decide to try it that way, let us know how it turned out for you. So glad it was a winner for you. After refrigerating overnight, how soon do you take out of refrigerator prior to serving? You should be able to serve immediately after taking it out of the fridge. I made it yesterday.. it was awesome. I used a deep dish store bought crust, added pecans and miniature chocolate chips. Turned out great! So rich and chocolatey!! Do you think it would be ok to make this 2 days ahead of eating, or will it get runny as it sits in the fridge? I've made this recipe for 30+ years, and the pie actually gets better after 2-3 days! Texture won't change.